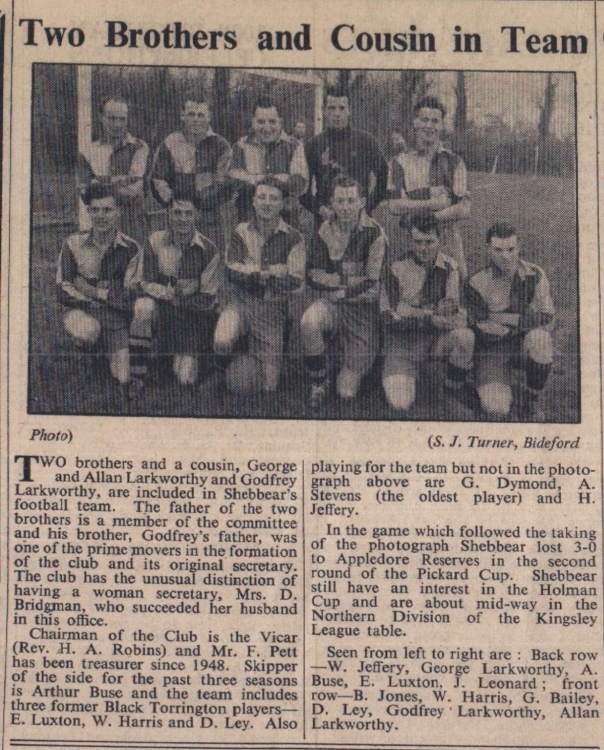 Two brothers and a cousin, George and Allan Larkworthy, and Godfrey Larkworthy, are included in Shebbear’s football team. The father of the two brothers is a member of the committee and his brother, Godfrey’s father, was one of the prime movers in the formation of the club and its original secretary. The club has the unusual distinction of having a woman secretary, Mrs D Bridgman, who succeeded her husband in this office. Chairman of the Club is the Vicar, Rev H A Robins, and Mr F Pett has been treasurer since 1948. Skipper of the side for the past three seasons is Arthur Buse and the team includes three former Black Torrington players – E Luxton, W Harris and D Ley. Also playing for the team but not in the photograph are G Dymond, A Stevens (the oldest player) and H Jeffery. In the game which followed the taking of the photograph Shebbear lost 3-0 to Appledore Reserves in the second round of the Pickard Cup. Shebbear still have an interest in the Holman Cup and are about midway in the Northern Division of the Kingsley League table. Seen from left to right – back row – W Jeffery, George Larkworthy, A Buse, E Luxton, J Leonard, - front row – B Jones, W Harris, G Bailey, D Ley, Godfrey Larkworthy, Allan Larkworthy.